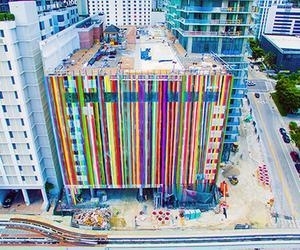 artist markus linnenbrink has installed a vibrant 40,000 square foot mural across the façade of miami‘s soon-to-be completed SLS brickell hotel and residences. best known for his signature ‘drip painting’ technique, linnenbrink has enlivened downtown’s monochromatic urban area with a colossal, chromatic landscape. commissioned by jorge m. pérez with the goal of giving the district a burst of color, the installation wraps the exterior of the architecture and sees vibrant stripes span from ground floor, to the building’s uppermost levels.